For other uses, see 21 Guns. For the three-shot rifle salute given at military and law enforcement funerals, see Three-volley salute. The custom stems from naval tradition, where a warship would fire its cannons harmlessly out to sea until all ammunition was spent to show that it was disarmed, signifying the lack of hostile intent. As naval customs evolved, 21 guns came to be fired for heads of state, or in exceptional circumstances for head of government, with the number decreasing with the rank of the recipient of the honor. While the 21-gun salute is the most commonly recognized, the number of rounds fired in any given salute will vary depending on the conditions. Circumstances affecting these variations include the particular occasion and, in the case of military and state funerals, the branch of service, and rank (or office) of the person to whom honors are being rendered. The tradition of saluting can be traced to the Late Middle Ages practice of placing oneself in an unarmed position and, therefore, in the power of those being honored. This may be noted in the dropping of the point of the sword, presenting arms, discharging cannon and small arms by firing them, lowering sails, manning the yards, removing the headdress or laying on oars. A Dutch man-of-war firing a salute. 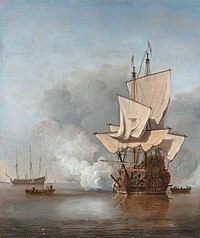 The Cannon Shot, painting by Willem van de Velde the Younger. The gun salute might have originated in the 17th century with the maritime practice of demanding that a defeated enemy expend its ammunition and render itself helpless until reloaded, a time-consuming operation. The gun salute had been established as a naval tradition by the late sixteenth century. A man-of-war which visited a foreign port would discharge all its guns to show that its guns were empty. Since the ship would not have enough time to reload before it was within range of the shore batteries, it was clearly demonstrating its friendly intentions by going in with empty guns. Salute by gunfire is an ancient ceremony. For years, the British compelled weaker nations to render the first salute; but in time, international practice compelled "gun for gun" on the principle of equality of nations. In the earliest days, seven guns was the recognized British national salute because seven was the standard number of weapons on a vessel. In that day, gunpowder made from sodium nitrate was easier to keep on dry land than at sea. Thus those early regulations stated that although a ship would fire only seven guns, the forts ashore would fire three shots to each one shot afloat, hence the number 21. The system of firing an odd number of rounds is said[by whom?] to have been originated by Samuel Pepys, Secretary to the Navy in the Restoration, as a way of economizing on the use of powder, the rule until that time having been that all guns had to be fired. Odd numbers were chosen, as even numbers indicated a death. With the increase in quality of naval gunpowder by the use of potassium nitrate, honours rendered at sea were increased to the shore salute. 21 guns became the highest national honor. There was much confusion because of the varying customs of maritime states, but finally the British government proposed to the United States a regulation that provided for "salutes to be returned gun for gun". The British at that time officially considered the international salute to sovereign states to be 21 guns, and the United States adopted the 21 guns and "gun for gun" return on 18 August 1875. Opening the Victory Day parade show on 16 December and the Independence Day celebration on 26 March. Occasions that happen to be largely associated with any national achievements or celebrations. Gun salutes are used at special holidays, state funerals, and for members of the Canadian Royal Family. The prime minister, heads of foreign missions, foreign heads of government, and the Vice President of the United States are entitled to a 19 gun salute. A 17-gun salute is given to the Canadian Minister of National Defence when visiting a saluting station (limited to once a year), as well as foreign ministers of defence. A 15-gun salute is given on certain occasions for the lieutenant governors of the provinces, such as the Speech from the Throne in a provincial legislature, or for special occasions such as state funerals of important persons. Before they were abolished in 1968 by the Trudeau government, royal salutes used to be fired in Ottawa, the provincial capitals, and Montreal and Vancouver also on the Queen's Accession Day (February 6), the Queen's actual birthday (April 21), the Queen's Coronation Day (June 2), the Birthday of the Duke of Edinburgh (June 10), and the Birthday of Queen Elizabeth the Queen Mother (August 4). The 21-gun salute is used in the Republic of China in honor of the President during National Day celebrations. After military band trumpeters sound the attention call, the audience is asked to stand up as the President enters. After she or he stands in the podium, the gun salute starts while the gun salute music is played. In some celebrations, it is done while the National Anthem is played, preceded by four ruffles and flourishes by a military band. This cannonade salute is used in relation to Czech presidential events and for the inauguration of the Prague Castle guard. It is fired to the sound of the National Anthem. The cannons used today were modified in 1993 from decommissioned 85mm vz.52 artillery cannons with electronic firing mechanisms by the Czech Military Technical Institute of arms and ammunition in Slavičín. The ammunition used is a version of blank shells, modified for an increased acoustic effect. Shots are traditionally fired from either two or four cannons so that, in the case of a failure of one of the weapons, the others will substitute it. The salute was given to the ex-president Václav Havel by an artillery battery of four cannons (each firing 21 times) from the Petřín hill on the 23 December 2011 during the commemorative service after his death. Gun salutes are used for a variety of occasions, mostly in honor of the Danish Royal Family. There are permanent salutory guns in place at Kronborg Castle in Elsinore, the Sixtus battery at Holmen naval base in Copenhagen, as well as at the naval base at Kangilinnguit in Greenland. A 27-gun salute is used in honor of Majesties, whereas the 21-gun salute is used in honor of other members of the Danish Royal Family. Gun salutes also occur during naval visits and when a foreign head of state arrives on a state visit. Also, when the Queen heads out on her annual summer cruise on the Royal Yacht Dannebrog, she is saluted when passing Kronborg. The day after the birth of Princess Benedikte in 1944 which took place during Nazi Germany's Occupation of Denmark, members of the Danish resistance group Holger Danske performed a salute of 21 bombs in the Ørstedsparken public park in central Copenhagen as a reference to the traditional 21-gun salute performed at the occasion of royal births. The 21-gun is accorded to the President of the French Republic, forming part of his "military honors" (honneurs militaires). The salute is given during the inauguration ceremony (by two 75mm guns) and during naval visits. These honors are extended to foreign heads of state when in State visit. All French Navy vessels anchored in a French harbor on Bastille Day must issue a 21-gun salute at noon, subjected to local regulation. The 21-gun salute is accorded to the President of India on several occasions. As soon as a new President is sworn in, a 21-gun salute is given. On Republic Day of India, every year, a 21-gun salute is given to the National Flag and the President, during the Flag Hoisting Ceremony. When a foreign head of State or head of government visits India, a formal reception is held at the Rashtrapati Bhavan, and the head of state is given a 21-gun salute, with a 19-gun salute given to a foreign head of government. Foreign sovereigns and members of their families. Prior to Indian independence in 1947, the Viceroy of India received a unique viceregal salute of 31 guns. After 1947, the 31-gun salute was retained for honouring the Governor-General of India (1947-1950), and for the President of India from 1950 until 1971, as several former Indian salute-state princes enjoyed 21-gun salutes even after independence. The 31-gun salute was used upon the inaugurations and official arrivals of Presidents of India, and was finally replaced with the 21-gun salute in 1971, when the former salute-state princes' privilege of receiving gun salutes was revoked. The more important of the hundreds of vassal rulers of princely states involved in indirect rule were classified by the number of guns used when paying honours to them, signifying their prestige in the eyes of the British. The highest of these so-called "salute states" (also in some other parts of the British Empire) enjoyed 21 guns. In Indonesia, the 21-gun salute is done during the state-visit of foreign state leaders in Indonesia. The responsibility of this activity is done by the Artillery units from the Indonesian Army and sometimes from the Indonesian Marine Corps Artillery regiments. In Israel the practice of gun salute has been eliminated since Israel has suffered many terror attacks and thus the firing of arms has a negative connotation. The three-volley salute is still used in military funerals. The 21-gun salute is used in events, such as the inauguration of the President, death of a top military official, death of a former president or courtesy calls of foreign leaders during their state visits. The practice is heavily influenced by the United States of America. On these days, the 21-gun salute is done by either the Philippine Army or the Philippine Marine Corps. The three-volley gun salute can also occur in the death of the low ranking military officials and soldiers who died heroically in combat while the 21-guns are reserved upon news of the deaths of national leaders. The normal 21-gun salute is also given to visiting heads of state upon their arrival at Malacañang Palace, with the guns manned by the Presidential Security Group. Other salutes include 19 guns for the Vice President of the Philippines, 17 for the Chief of Staff, AFP, service commanders and the Secretary of National Defense. 15 guns are fired for other Cabinet secretaries. In Poland the 21-gun salute is used in military funerals and funerals of fallen leaders and heroes. Known as the Salwa Honorowa (Honour Salute), it is also used in national holidays. In Pakistan a 21-gun salute is used on occasions such as on Pakistan Day (23 March), on which a 21-gun salute is given in provincial capitals and 31 in Islamabad, the federal capital. It is also given on Independence Day (14 August) and Defence Day (6 September). A 31-gun salute in Islamabad and a 21-gun salute in provincial capitals is also given on 12 Rabi-ul-Awwal the birth date of Prophet Muhammad. It is also given when a foreign president or prime minister visits Pakistan. Salute with 21 cannons is awarded in honor of the National Day, the National Anthem or Flag, in honor of a sovereign or a foreign head of state. Russia uses a 21-gun salute on holidays such as on Defender of the Fatherland Day (23 February), Victory Day (9 May), and Russia Day (12 June), during parades (as the National Anthem is played) and during the nighttime ceremony of salute firing on holidays. Contrary to belief, foreign leaders are not entitled to a 21-gun salute during state visits to Russia. A 21-gun salute is carried out for National Day Parades in Singapore by the Singapore Artillery during the presidential inspection of parade contingents. In a rare occurrence, the 21-gun salute was given to the former Prime Minister and founding leader Lee Kuan Yew during his state funeral. In Sri Lanka, the Sri Lanka Artillery carries out a 21-gun salute on state occasions, accorded to the President or a visiting heads of state. The salute is delivered from Ordnance QF 25 pounders of the Ceremonial Gun Troop. Traditionally, the Sri Lanka Navy accords a 25-gun salute to the nation on the National day, which is 4 February each year. The salute is fired from the ceremonial naval gun battery at Colombo Lighthouse. It began with HMCyS Vijaya of the Royal Ceylon Navy, the first warship of the navy according a 25-gun salute on 4 February 1951 with its single 4-inch gun. 21-gun salutes mark special royal occasions throughout Sweden, referred to as a Kunglig Salut (Royal Salute). The number of rounds fired in a salute depends on the place and occasion. The basic salute is 21 rounds. However, when a birth takes place within the Royal House of Sweden, and the child is the firstborn to either the reigning monarch or to the heir to the throne, an extra 21 rounds (for a total of 42) are added to the normal salute. In all other births 21 rounds are fired. Gun salutes also occur at royal weddings, royal births, royal deaths and when a foreign head of state arrives on a state visit in Stockholm. Military saluting stations are Skeppsholmen and Kastellholmen in Stockholm, Fortress of Kungshall in Karlskrona, Battery of Fårösund on the island of Gotland, Boden Fortress in Boden, Battery of Kusthöjden in Härnösand, Vaxholm Castle in Vaxholm, Skansen Lejonet Fortress and Älvsborg Castle in Gothenburg. 19-gun salutes are used for heads of government, cabinet ministers and ambassadors. The Swedish Armed Forces also use a gun salute consisting of two rapid gunshots. This salute, called Svensk Lösen (Swedish signal), was fired whenever a Swedish ship would enter a harbour in order to identify the ship as Swedish, or on the field of battle to identify the Swedish troops. Sometimes a double signal was fired, i.e. four gunshots fired two and two, hence the Swedish tradition of a fourfold cheer instead of a threefold. This signal is today fired on special occasions, usually within the military. 21-gun salutes mark special royal occasions throughout the United Kingdom and the Commonwealth, referred to as a "Royal Salute" (in the British Empire it was reserved, mainly among colonial princely states, for the most prestigious category of native rulers of so-called salute states), unless rendered to the president or flag of a republic; nonetheless salutes rendered to all heads of state regardless of title are casually referred to as "royal" salutes. The number of rounds fired in a salute depends on the place and occasion. The basic salute is 21 rounds. In Hyde Park and Green Park an extra 20 rounds are added because they are Royal Parks. At the Tower of London 62 rounds are fired on royal anniversaries (the basic 21, plus a further 20 because the Tower is a Royal Palace and Fortress, plus another 21 'for the City of London') and 41 on other occasions. The Tower of London probably holds the record for the most rounds fired in a single salute — 124 are fired whenever the Duke of Edinburgh's birthday (62 rounds) coincides with the Saturday designated as the Queen's official birthday (also 62 rounds). Gun salutes also occur when Parliament is prorogued by the Queen, on royal births and when a visiting head of state meets the Queen in London, Windsor or Edinburgh. A Royal Salute of 21 Guns is fired at Edinburgh Castle in honour of The Queen or her Personal Representative, the High Commissioner (female) or Lord High Commissioner (male), when processing in state to the Opening of the General Assembly of the Church of Scotland which occurs annually in May. The significance of the 21 Gun Salute is that the Lord High Commissioner is representing the Sovereign as Head of State. Salutes are also fired in Gibraltar. In London, salutes are fired from Hyde Park and the Tower of London; on State Visits, at the State Opening of Parliament and for Trooping the Colour, Green Park is used instead of Hyde Park. In Hyde Park, the salute is fired by the King's Troop, Royal Horse Artillery. The first round is fired at noon (11am on The Queen's official birthday). At the Tower of London, the salute is fired by the Honourable Artillery Company at 1pm. Salutes in Northern Ireland are usually fired from Hillsborough Castle by 206 (Ulster) Battery, although recently they have also been fired from HMS Caroline in Belfast Harbour. 19-gun salutes are used for Field Marshals, ambassadors, and the heads of executive branch of Parliamentary governments (i.e. Prime Ministers). At 6am annually, in the market town of Lewes, a mortar is fired from the battlements to mark when Guy Fawkes was found and marks the start of Bonfire Night. The mortar is traditionally followed by the sound fire crackers and bangers being let off throughout the town. On 16 November 1776, the West Indian port of St. Eustatius returned a 9-gun salute for the 13-gun salute given by the U.S. brigantine Andrew Doria. At the time, nine guns was the customary salute to an independent republic. This First Salute was specifically ordered by the Dutch governor of the island, and marks the first formal international recognition of the United States as an independent republic. The flag flown by the Andrew Doria was the Grand Union Flag, 13 alternating red and white stripes with the British Flag in the union. The Stars and Stripes received its first salute when John Paul Jones saluted France with 13 guns at Quiberon Bay in 1778 (the Stars and Stripes was not adopted as the national flag until 14 June 1777). The practice of firing one gun for each state in the union was not officially authorized until 1810, when the United States Department of War declared the number of rounds fired in the "National Salute" to be equivalent to the number of states—which, at the time was 17. The tradition continued until 1841 when it was reduced from 26 to 21. In 1842, the United States declared the 21-gun salute as its "Presidential Salute". While the "National Salute" had been formally established as the 21-gun salute, the current tradition holds the salute on Independence Day to be a 50 rounds—one round for each state in the union. This 'Salute to the Nation' is fired at noon on 4 July, on U.S. military installations, while the U.S. Navy full-dresses ships and fires 21 guns at noon on 4 July, as well as on Presidents' Day. In April 1914, during the Mexican Revolution, the Tampico Affair occurred, and escalated as a result of a twenty-one gun salute (or more specifically, the lack of one). Nine unarmed U.S. sailors were arrested in Tampico, Tamaulipas, Mexico, for entering an off-limit area at a fuel loading station. Despite being released, the U.S. Naval commander demanded an apology and a twenty-one gun salute. The apology was provided, but not the salute, giving President Woodrow Wilson reason to order the U.S. occupation of the port of Veracruz. Due to an arms embargo from the United States, issued to try to lessen the bloodshed of the revolution at its border, Mexico was forced to seek arms from European, and to a lesser extent Asian countries. During the occupation, a large German arms shipment aboard the SS Ypiranga was illegally seized, before being released and turned away by the U.S. occupation force. These events ultimately drove a wedge between Mexican-U.S. and German-U.S. relations, and after the start of World War I on 28 July 1914, would cause Germany to seek to influence Mexico into declaring war on the United States, in order to halt U.S. arms shipments to the Allies, and attempt to prevent the then isolationist United States from joining the Allies. This effort ultimately backfired, after culminating in the sending of the Zimmermann Telegram from Germany to Mexico, which urged Mexico to declare war on the United States, promising support and the return of much of the territory lost during the Mexican–American War, which, after being intercepted, caused the U.S. to enter the war on the side of the Allies on 6 April 1917, and due in large part to the arrival of fresh U.S. troops into the war, largely a stalemate in its first years, would lead to the surrender of Germany on 11 November 1918, after helping to overpower the German Army, already fatigued from a long and costly war. On Memorial Day, batteries on military installations fire a 21-gun salute to the nation's fallen. As well, batteries at Naval stations and on ships, fire a salute of 21-minute guns and display the ensign at half-mast from 8 a.m. until completion of the salute. Today, a 21-gun salute is rendered on the arrival and departure of the President of the United States; it is fired in concordance with four ruffles and flourishes, which are immediately followed by "Hail to the Chief"—the actual gun salute begins with the first ruffle and flourish, and 'run long' (i.e. the salute concludes after "Hail to the Chief" has ended). A 21-gun salute is also rendered to former U.S. Presidents, foreign Heads of State (or members of a reigning royal family), as well as to Presidents-elect. In such a ceremony, the national anthem of the visiting dignitary's country is played, following the salute. In accordance with the ceremonial standard operating procedure (SOP) of the 3rd US Infantry (The Old Guard) the various gun salutes are assigned as follows: each round in a given salute is fired one at a time. The number of cannon used in a battery depends upon the intervals between each round fired. This includes, for example, a three-gun battery firing two of its guns with five-second intervals between rounds and one gun remaining at the ready in case of a misfire; such a battery would be used at an Armed Forces Full Honors Funeral, or for State Arrival Ceremony of a foreign dignitary at the Tomb of the Unknowns in Arlington National Cemetery. A four-gun battery has its first three guns firing rounds at three-second intervals, with the fourth gun (again) at the ready in case of misfire. The SOP also provides each gun salute a two-man gun crew (one loader, one gunner) for each cannon, as well as a five-man "staff" of soldiers to give the fire commands. The staff includes an Officer in Charge, a watchman (who marks the intervals and signals each gun to fire), an assistant watchman (as a backup), a counter (who keeps track of the number of rounds fired and signals the last round to the Officer in Charge), and a Non-Commissioned Officer in Charge (who marches the battery into place as well as signals the backup cannon to fire in case another gun misfires). Naval vessels now have saluting guns installed which are used solely for such purpose. Nineteen-gun salutes are reserved for the Vice President of the United States, foreign deputy heads of state, cabinet members, Speaker of the House of Representatives, President pro tempore of the Senate, Chief Justice of the United States, state Governors, foreign heads of government (such as Prime Ministers), chiefs of staff and general officers in the U.S. military of five-star rank. For each flag rank junior to a five-star officer, two guns are subtracted (e.g., for a four-star admiral, a 17-gun salute is prescribed; a three-star general would rate a 15-gun salute; a two-star, 13 guns, and a one-star, 11 guns). A gun salute is not to be confused with the three-volley salute often rendered at military funerals. The President of the United States, former Presidents and Presidents-elect. Chiefs of state, heads of government and reigning monarchs. 19 Vice President of the United States, Speaker of the House of Representatives, President pro tempore of the Senate, Chief Justice of the United States, Cabinet officers. Governors of a U.S. state, the Deputy Secretary of Defense, the Director of Defense Research and Engineering, a Prime Minister or Premier, the Chairman of the Joint Chiefs of Staff, the Chief of Staff, U.S. Army, the Chief of Staff, U.S. Air Force, the Chief of Naval Operations, the Commandant of the Marine Corps, a Fleet Admiral, General of the Army or General of the Air Force and Ambassadors, High Commissioners, and others whose credentials are at least equivalent to those of an ambassador. 17 Governor General or Governor of a Territory, Commonwealth, or Possession of the United States or an area under U.S. administration, Committee of Congress, Assistant Secretaries of Defense, General Counsel of the Department of Defense, Under Secretaries of the Army, Navy, or Air Force. Admiral, General. 15 Envoy Extraordinary and Minister Plenipotentiary. Vice Admiral, Lieutenant General. 7 Consuls accredited to the U.S. Vice-consuls when in charge of consulate. 5 Vice-consuls and consular agents. A U.S. presidential death also involves 21-gun salutes and other military traditions. On the day after the death of the president, a former president or president-elect—unless this day falls on a Sunday or holiday, in which case the honor will be rendered the following day—the commanders of Army installations with the necessary personnel and material traditionally order that one gun be fired every half-hour, beginning at reveille and ending at retreat. On the day of burial, a 21-minute gun salute traditionally is fired starting at noon at all military installations with the necessary personnel and material. Guns will be fired at one-minute intervals. Also on the day of burial, those installations will fire a 50-gun salute—one round for each state—at five-second intervals immediately following lowering of the flag. The title of the Green Day song "21 Guns" is a reference to a 21-gun salute. In the song "For Those About to Rock (We Salute You)" by AC/DC 21-gun salutes are mentioned, including the use of Napoleonic cannons. The song "Move Now" by Nonpoint also includes a reference. In the film Chitty Chitty Bang Bang, when the Grandfather sings "Posh" whilst dangling from a hot air balloon, there is a line "they 21 gun salute me". Boston-based Celtic punk band Dropkick Murphys recorded the song "21 Guitar Salute" (originally by The Press) on their 2002 split EP Face to Face vs. Dropkick Murphys. The 21-gun salute are also mentioned in the song "Methods to your Madness" by heavy metal band Metal Church. Another mention is in the Clutch song "The Mob Goes Wild". British Grime artist Stormzy included a song titled "21 Gun Salute" on his debut album Gang Signs & Prayer. The 2000 U.S. Open Golf Championship, held at the famed Pebble Beach Golf Links, saw a unique twist on the 21-gun salute. The tournament's defending champion, Payne Stewart, had died in a plane crash the previous October. Before the tournament began, a ceremony was held in Stewart's memory in which 21 golfers lined up on the 18th fairway and hit drives into the Pacific Ocean. ^ "Origin of the 21-Gun Salute". ^ a b "The Honours, Flags and Heritage Structure of the Canadian Forces" (PDF). Archived from the original (PDF) on 25 March 2009. Retrieved 12 February 2014. ^ Toporoski, Richard. "Royal Birthday Salute". Canadian Royal Heritage Trust. Retrieved 18 May 2015. ^ The India Office and Burma Office List: 1945. Harrison & Sons, Ltd. 1945. pp. 44–45. ^ "Swearing-in Ceremony of President-Elect and Ministers" (PDF). Archive - Press Information Bureau of India. ^ "Salute". Royalark.net. Retrieved 12 February 2014. ^ "17 Cannon Shots by the Indonesian Army Accompanied the seconds of Proclamation". Pos Kota (in Indonesian). poskotanews.com. 17 August 2016. Retrieved 13 June 2017. ^ "The State Funeral Procession and Funeral Service for the late Mr Lee Kuan Yew" (PDF) (Press release). Government of Singapore. 27 March 2015. Archived from the original (PDF) on 10 April 2015. Retrieved 10 April 2015. ^ "21-gun salute to bid Mr Lee Kuan Yew farewell on Sunday: Ng Eng Hen". Channel News Asia. ^ "Gun Salutes". royal.gov.uk. Archived from the original on 17 March 2015. Retrieved 22 March 2015. ^ "Queen's Regulations for the Army" (PDF). QR Army July 2013, paragraph 8.062. Retrieved 14 June 2016. ^ "The Border - 1914 The Tampico Affair and the Speech from Woodrow Wilson". PBS. Retrieved 27 November 2014. ^ "Cannon or Gun Salute". Sizes.com. 29 August 2012. Retrieved 12 February 2014. ^ "Payne Stewart honored with 21-ball salute". Sportsillustrated.cnn.com. 14 June 2000. Retrieved 12 February 2014. Wikimedia Commons has media related to 21 gun salute.